Then I started to think even deeper about this Your Text Here T-Shirt and I decided it is probably the ultimate conversation starter. 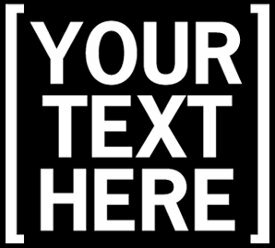 I bet people can help but suggest something for their text. It basically demands it. Your Text Here. It’s like filling out a tax form or something. And, boom, they say ambrosia salad is great. And then all of a sudden you’re talking fresh fruit versus canned. Where the best mandarin oranges are grown. Why you like traveling. Why you should travel together. And, now, you have a new best buddy, world traveling partner for life. And that’s pretty cool, especially for the miniscule price of a tshirt. T shirt Hell generally is totally offensive, and you feel dirty for even knowing they exist, but this particular offering is nothing but good vibes and network building. Oh wait, this is Torso Pants…that makes more sense.